Donations may also be made to the family. 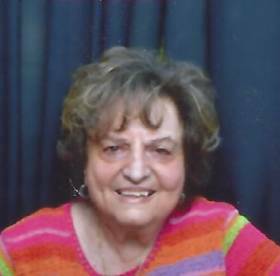 Catherine Zotos (Nee Perakis) Age 82, of Livonia, passed away May 1, 2016. Loving mother of Rev Dr Gregory E. Zotos DD PhD. She is preceded in death by her husband Van Zotos, daughter Connie Zotos and parents Alfreda and Angelo. Cherished sister of Connie Vlahakis (George) and Dean Perakis (Marge). Aunt of Irene Zannis (John), Steve Vlahakis (Sofia), Stefanie Exline (Andy) and Angelo Perakis (Adriane). Survived by many nieces and nephews. Attended Post middle school and Cooley High School –a Cooley Cardinal. Graduated with high honors from Wayne State University with a Doctorate in Clinical Psychology and Master’s in Education. Tayght in Detroit public schools. Retired Sunday school teacher at St. Nicholas Greek Orthodox Church. Cathy loved to do word searches, all computer games, challenging mind games, watch game shows, and enjoyed chatting with relatives and friends. She was a retired mall walker, (Cathy use to walk 6 hours a day, 7 days a week) and attended meetings with Post and Cooley high school monthly meetings as well. She also volunteered at Metro Vision community access and City of Livonia channel, producing and directing shows, substitute teaching and the OPA! Fest at church. She taught Greek at St Constantine and Helen Greek Orthodox church. She will be deeply missed. Family will receive friends at Neely-Turowski Funeral Home, 30200 Five Mile Rd., Livonia Wednesday 2-8pm and a Funeral Mass Thursday10am instate at 9:30am until Mass begins at St Nicholas Greek Orthodox Church, 760 West Wattles Rd., Troy. To sign the online guestbook go to www.turowskilifestory.com. In lieu of flowers the family suggests donations be made to the family or to St. Nicholas Greek Orthodox Church.